'Forever Blue' (Chuck Chapman, R. 1996). Seedling 92-190-2. SDB, 12" (31 cm), Early bloom and rebloom. Light blue violet self; beards medium violet blue. 'Shy Violet' X seedling 90-45-4: (('Velvet Caper' x 'Michael Paul') x 'Sigh'). Chapman Iris 1997. Loïc Tasquier said: "A must have: blooms whenever a fan reaches maturity from May till frost! Fertile both ways, here are the seedlings i got from it." Interested in Standard Dwarfs? 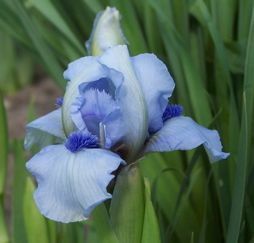 Please visit the: Median Iris Society website. jpg FOREVER_BLUE_ac.jpg manage 45 K 11 Mar 2011 - 15:15 AdamCordes Taken in my garden, 2008. USDA Zone 4.
jpg P1490223-X2_forever_blue.jpg manage 289 K 17 Feb 2016 - 06:25 BrockHeilman Please contact Brock Heilman for image use. JPG foreverblue04.JPG manage 81 K 15 Apr 2014 - 23:10 Main.TLaurin Photo by Don McQueen,London, Ont. Canada Zone5. jpg foreverblue4.jpg manage 16 K 09 Aug 2018 - 02:27 Main.TLaurin Photo by Colin Campbell- Iris Hills Farm. JPG foreverblue99.JPG manage 78 K 29 May 2014 - 18:47 Main.TLaurin Photo by Don McQueen,London, Ont. Canada Zone5.